French multinational automobile manufacturer, Renault, is considering the establishment of an automobile assembly plant in Ghana, following in the footsteps of Volkswagen, Nissan and Sinotruk who will, this year, establish assembly plants in Ghana. 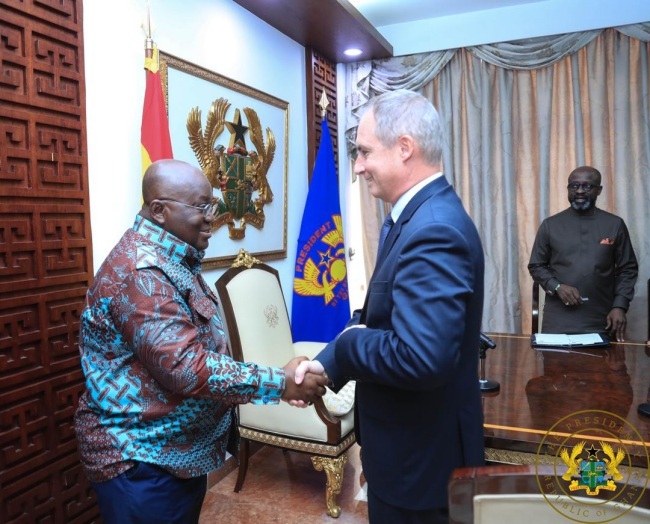 Vice President and Chairman of the Africa-Middle-East-India (AMI) Region at Renault, Fabrice Cambolive, made this known on Monday, 28th January 2019, when he paid a courtesy call on the President of the Republic, Nana Addo Dankwa Akufo-Addo, at Jubilee House, the seat of the nation’s Presidency. On his part, President Akufo-Addo described the announcement as good news for the country. He told the Renault Chairman that Ghana is the most ideal country in West Africa to establish an assembly base, and noted that all the economic indices which had gone haywire prior to his assumption of office are now pointing in the right direction. Ghana, under the leadership of President Akufo-Addo, is now the largest recipient of Foreign Direct Investment in West Africa. Renault is a French multinational automobile manufacturer established in 1899. The company produces a range of cars and vans, and in the past has manufactured trucks, tractors, tanks, buses/coaches and autorail vehicles. According to the Organisation Internationale des Constructeurs d’Automobiles, in 2016 Renault was the ninth biggest automaker in the world by production volume. By 2017, the Renault–Nissan–Mitsubishi Alliance had become the world’s biggest seller of light vehicles, bumping Volkswagen AG off the top spot. Renault has a 43.4% controlling stake in Nissan of Japan, and a 1.55% stake in Daimler AG of Germany (since 2012, Renault manufactures engines for the Daimler’s Mercedes A-Class and B-Class cars). Renault also owns subsidiaries RCI Banque (automotive financing), Renault Retail Group (automotive distribution) and Motrio (automotive parts). Renault has various joint ventures, including Oyak-Renault (Turkey), Renault Pars (Iran). The French government owns a 15% share of Renault.